And the leaks are on a roll! After seeing the specs of the Nokia Lumia 920 and Lumia 820 we saw the wireless charging pad leaking earlier today. 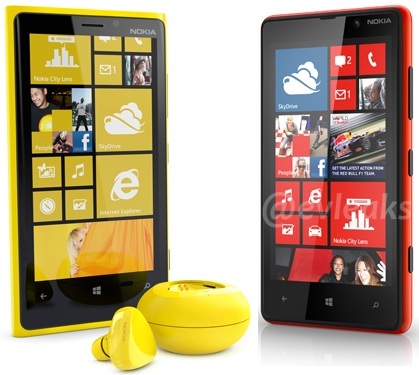 But now the latest to join the gang of leaks is a picture where the Nokia Lumia 920 and Lumia 820 pose next to each other with another accessory. As you can see in the picture above, the Lumia 920 poses along with what we feel is the Luna headsets which Nokia launched earlier this year. The Luna headsets are Bluetooth enabled and also NFC compatible which can be connected to any NFC enabled device with just a tap. This might also go on to almost confirm that the Nokia Lumia 920 and 820 might arrive with NFC capability on-board. Oh and the Luna headsets might now arrive in new colours as we can see in the picture above. The Lumia 920 is sporting yellow colour and the Luna matches it. Earlier when Nokia has launched the Luna headsets, they arrived in colours matching the first generation of Nokia Lumia smartphones. And now an improved version of the headsets might be unveiled tomorrow.